← How to edit image comment in docPrint preview application? How to convert PDF to TIF and make tif colorful as original pdf? 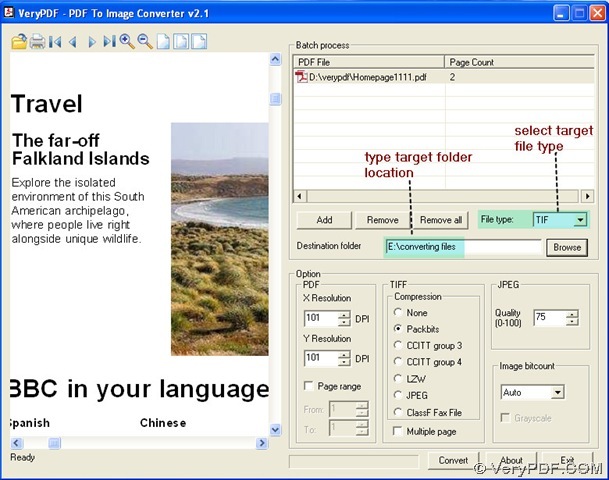 PDF To Image Converter v2.1 can convert PDF to TIF and make tif colorful one time. In PDF To Image Converter v2.1, the compression options are existed for TIFF format, so I will explain how to convertPDF to TIF and make it colorful together in the following paragraphs. 2. Add pdf into batch process field, click its route to preview it in preview area. If hecking on your pdf file, you could use those icons mentioned in the picture above to preview it in details. 3. Choose your target format as TIF in “File type” menu, then type your folder location into the edit-box of “Destination field”. In the condition of the same image bitcount, there is no doubt that no compression will lead tif the most biggest in size; other compression format are different in size, too. So here we choose “None” as compressed format for tif as our example, and let other options unchanged like “Auto” in the menu of “Image bitcount”, which can guarantee colorful like original pdf. To get multiple pages in one tif file, you could click the check-box of “Multiple page” in PDF To Image Converter v2.1. 5. Process its converting PDF to TIF through clicking “Convert” button, later you will get your colorful tif. Then shut down your converter. 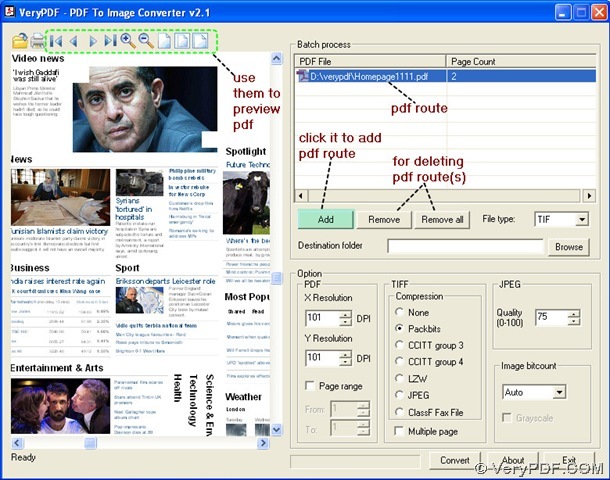 To know more info about PDF To Image Converter v2.1, click here: http://www.verypdf.com/pdf2tif/index.htm#dl. I want a bigger dimension tif, what should I do during the process from pdf to tif? How to convert the 2nd page of PDF to TIF? I want to convert Azeri pdf to tif, what should I do? 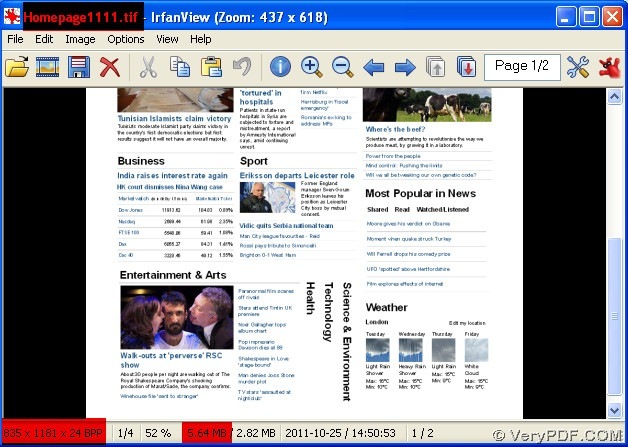 How to convert PDF to TIF with JPEG compression? How should I convert PDF to TIF to get a grayscale TIFF image with using PDF To Image Converter? How to use compression mode to convert pdf to tif with black and white pattern? Is VeryPDF PDF to Image SDK support a PDF file which contain more than 700 pages? How to convert the 1st page of PDF to JPG? How to convert PDF to image and set image bit-count? This entry was posted in PDF to Image Converter and tagged PDF To Image Converter, PDF to TIF. Bookmark the permalink.